One Ontario man’s tiny act of kindness is making a huge impact on social media. 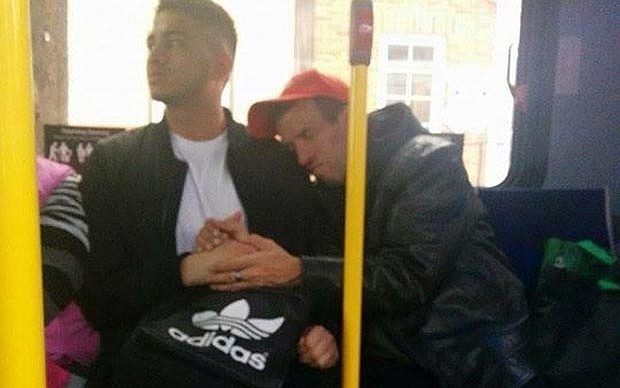 Godfrey Cuotto, a 21-year-old student in Hamilton, Ont., was photographed holding hands with a man named Robert with special needs on a local bus earlier this week. The photo, which was later posted on the Facebook page “Only In Hamilton” on Tuesday by a stranger, has now gone viral. Cuotto says he was coming home from a burrito joint downtown when he entered a packed bus, and a man sitting near the front wanted to shake his hand. A little taken aback at first, the McMaster student says he then shook Robert’s hand. Over the 30-minute bus ride, Cuotto says the man held his hand, leaned on him, hugged him and also kissed his hands throughout the ride. Robert’s family member later contacted Cuotto on Facebook and thanked him for comforting their uncle. They also told him Robert suffered from cerebral palsy and was deaf.